I am back from Mexico and, although there for less than a week, there was much to take in. My most sincerest thanks to all my readers for your safe-travels well-wishes and kind thoughts! The butterflies were dazzling and beautiful beyond imagination, but also very sad. This wondrous migration of the Monarchs, which has taken place for over a million years, is in serious peril. If changes are not made very soon, the migration will end. I’ll write more about my trip and the extraordinary scientist that led our expedition, Doctor Tom Emmel, this weekend after I am all caught up with design work and photography projects. Additionally, I interviewed Dr. Emmel at the top of the Sierra Chincua Monarch Colony, located in Michoacán at 10,000 feet above sea level, and will be bringing readers the full interview! 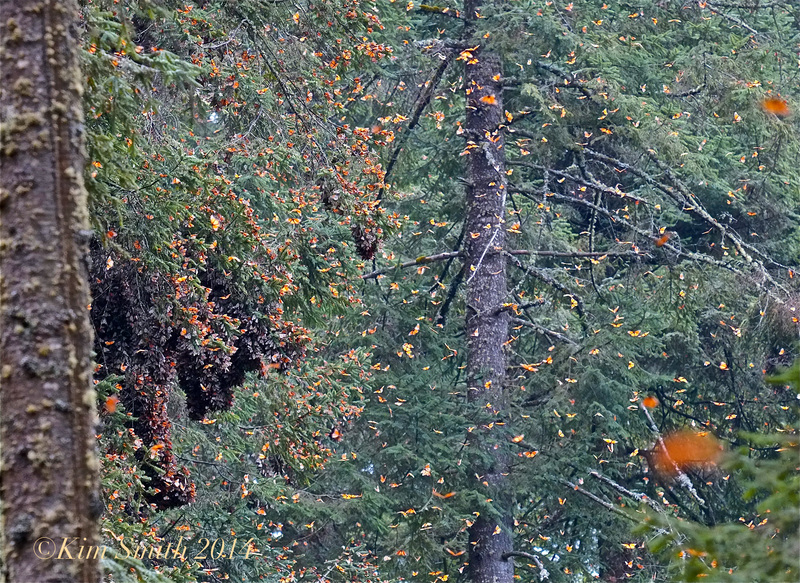 This entry was posted in Monarch Butterfly in Crisis, Monarch Butterfly Migration in crisis and tagged Angangueo, Mexico, Michoacán, Monarch Butterfly Migration, monarch butterfly migration Mexico, Sierra Chincua Monarch colony on February 28, 2014 by Kim Smith.